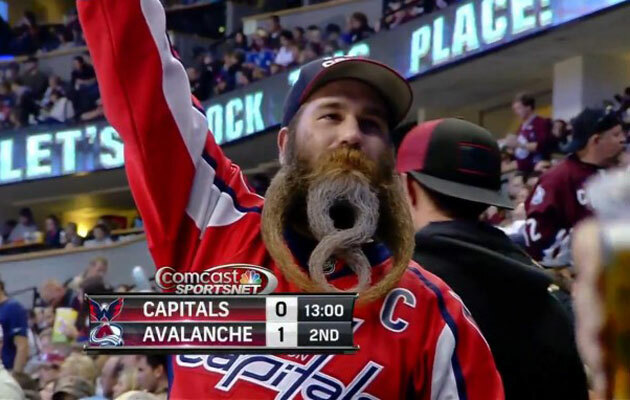 By now, you’ve probably seen the phenomenal “8” beard of the Capitals beard guy. His name is Eric Brooks and his beard is multi-talented. Brooks moved to Denver from Rockville, Md. and now graces Caps-Avalanche games with the presence of his beard as he first did in 2013 when he unveiled the 8. He unveiled a new design for Wednesday’s game and stole the show. Molded to perfection Brooks managed to style his beard into a white “CAPS” leaving people like me with barely a five o’clock shadow with some serious beard envy. Never stop being you, Brooks.